Pomegranates are such a powerful fruit. As we discussed in part one of this article, the overwhelming amount of antioxidants pomegranates offer have many incredible advantages on your performance, appearance, and health. But, my personal favorite reason to eat pomegranates is simple… they are delicious! 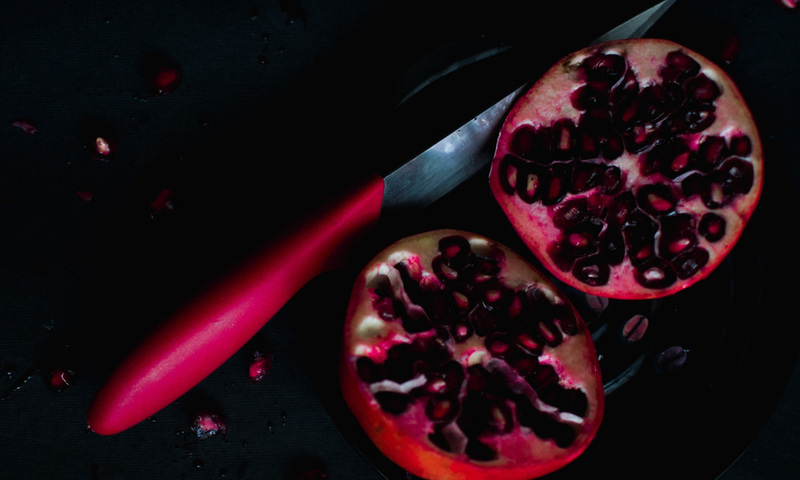 Here are 3 easy recipes to help incorporate more miraculous pomegranate into your diet. When choosing a fresh pomegranate, look for one with a deep purplish-red color that is heavy and dense for its size. Many stores will carry the arils prepared and ready to eat, making them even easier to enjoy. The juice is available at most grocers even when pomegranates are not in season, so you can benefit from the healthy antioxidants year round. Crisp and refreshing, this drink is a delicious way enjoy pomegranate juice. Serve up this virgin cocktail anytime of day, or add a little rum to make things interesting. Ingredient tip: Traditionally, Mojitos are made with granulated sugar. If you don’t mind the extra calories, you can substitute sugar or agave syrup for the Stevia. Don’t forget that adding it, or a shot of rum, will change the nutritional values listed below. In a cocktail shaker or large study glass, combine the mint, Stevia and lime juice. Muddle the ingredients until the mint leaves and limes are well mashed. If you don’t own a muddler, the blunt end of a cooking utensil like a spatula or wooden spoon will do the trick just fine. Add pomegranate juice (and rum if you choose to) and mix well. Place the ice in a glass and pour the mixture over the ice. Add the club soda and briefly stir. Garnish with a few pomegranate seed and a lime wedge (optional). Tender spinach, buttery avocado, and sweet mango pair perfectly with the tangy juice bursting out of each pomegranate seed. With antioxidants, healthy fats, vitamins, minerals and fiber, this salad will satisfy your taste buds and boost your health. Enjoy with grilled chicken breast or your favorite protein to make this meal complete. In a small bowl, combine all ingredients for the dressing. Mix well. Set aside. On a large plate, spread the baby spinach leaves. Top with alternating slices of mango and avocado. Spoon the pomegranate seeds on to the center of the salad. Drizzle the dressing lightly over the entire salad. This savory roast is extremely simple to make but tastes like fine dining. After just a few hours in the slow cooker, you’ll find a tender piece of meat packed with flavor, ready to enjoy with your favorite vegetable side dishes. Clean the pork loin and pat dry. Place the pork loin on a large plate and aside. In a small bowl combine the oregano, coriander, chili powder, black pepper, salt and cayenne pepper. Mix completely. Coat the entire pork loin evenly in the mix of dry spices, then place the pork loin into the slow cooker. In a small bowl, combine the olive oil, minced garlic, balsamic vinegar, Dijon mustard, and maple syrup. Stir until well blended. Gently spoon the mixture over the pork loin. Pour the pomegranate juice into the slow cooker, gently drizzling some over the pork loin. Set the slow cooker to high. Roast for 4 hours. Gently transfer the pork loin from the slow cooker to a serving dish. Let rest for 10 minutes before carving. Serve warm. Serving tip: The drippings are delicious drizzled over the pork, or you can use them to make a flavorful gravy. All recipes and images are the intellectual property of Kendall Lou Schmidt.